Does the Waveforms spectrum analyzer have options for zero padding? 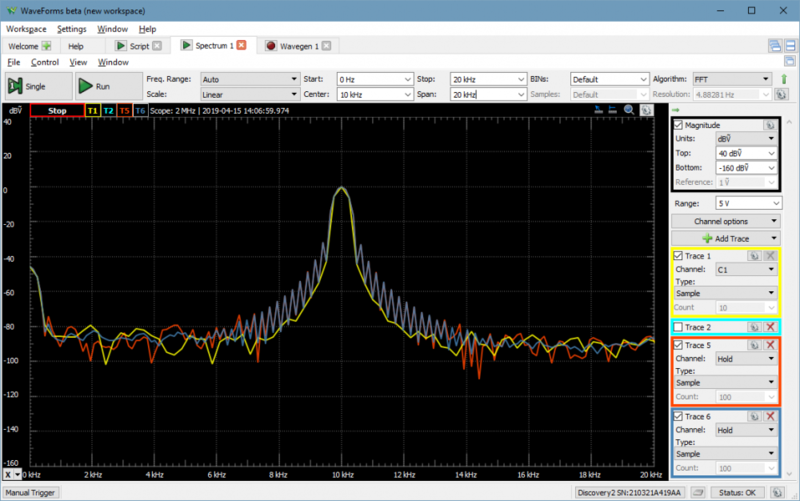 I've seen in other FFT applications that increased zero padding can improve the look of an FFT at low frequencies when monitoring over a wide frequency range, like 10kHz to 20MHz. 1. 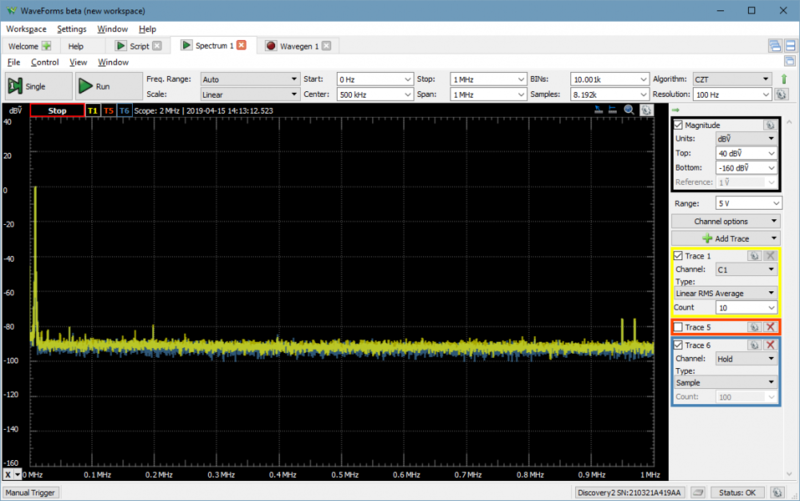 For lower frequencies, with 1MHz sampling you can use the Scope to perform a longer recording. This will highly improve the resolution in the FFT view. 2. With AD you can select the second device configuration to have 16k Scope buffer. 3. You can select a higher bandwidth window, like rectangular or cosine. 4. In the latest beta version with CZT algorithm you can select higher number of bins, higher resolution. Is there a way to have the zero padded trace continue to run and be averaged? This is great! Thanks @attila! Does this script end up with a rectangular window? 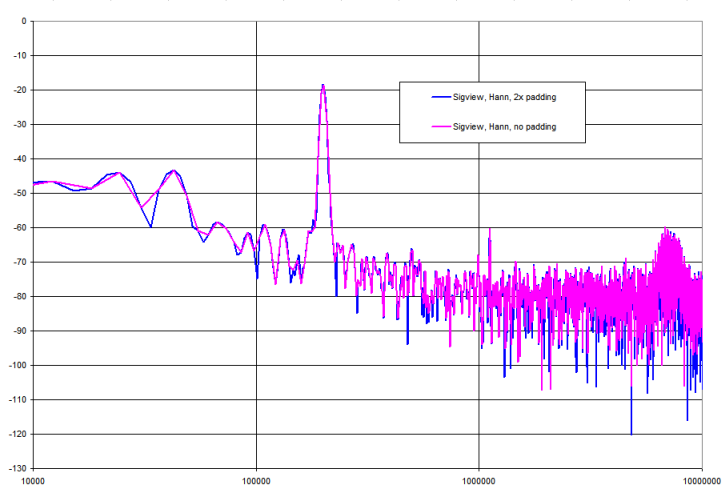 The padded, averaged result from the script looks very different from our previous unpadded result. Is there a way to set the type of windowing function that is used in your script? We'd like to use a Hann window. I tried to look through other objects/functions with cntrl+space, but didn't see any way to set the window type. for(var i = 0; i < 2*c; i++) rg.push(t) //4x padding??? You can configure the window for Trance 5 in the Spectrum interface. The script feeds the time domain data to T5 and this performs the FFT. The script takes magnitude array from T5, performs averaging and sets this to T6. I'm not sure if the padding is useful. To improve or artificially increase the resolution you should use the other options I pointer out in the first reply. Adding much padding will push the effective signal to the edge of the window, damping and attenuating it further. 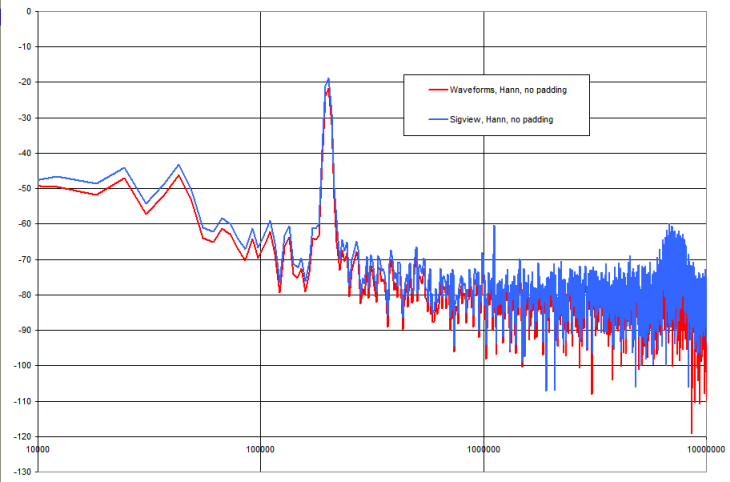 Here to demonstrate the effect: M1 generates a Hann window, M2 applies it on the data. 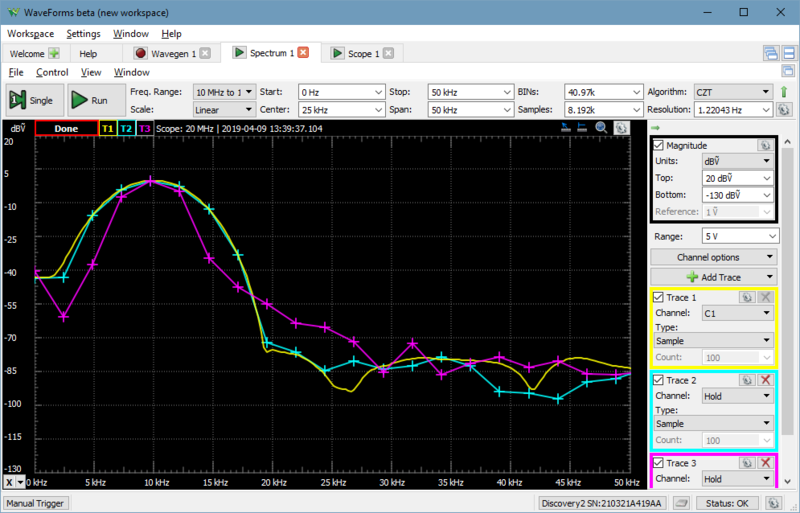 The originally +5.3dBV signal is seen as -11dBV. Thank you for the continued support on this, @attila! These are the two FFTs I'm getting in Waveforms, no padding in red and 2x padding in green. 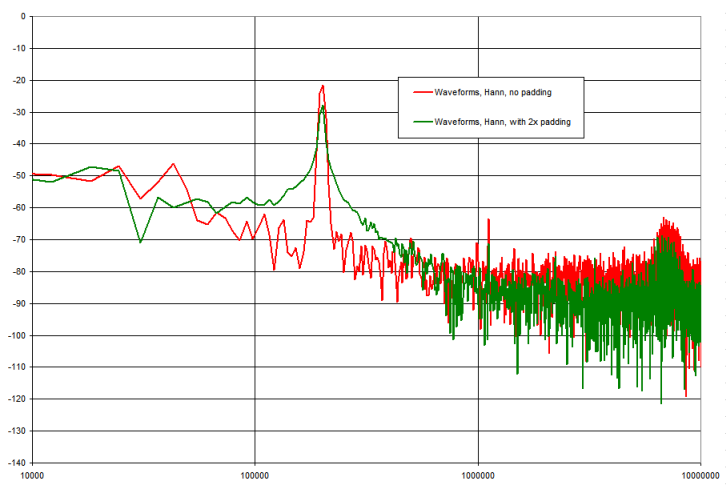 You can see that the 2x padding trace in green does not look at all like the red trace without padding. 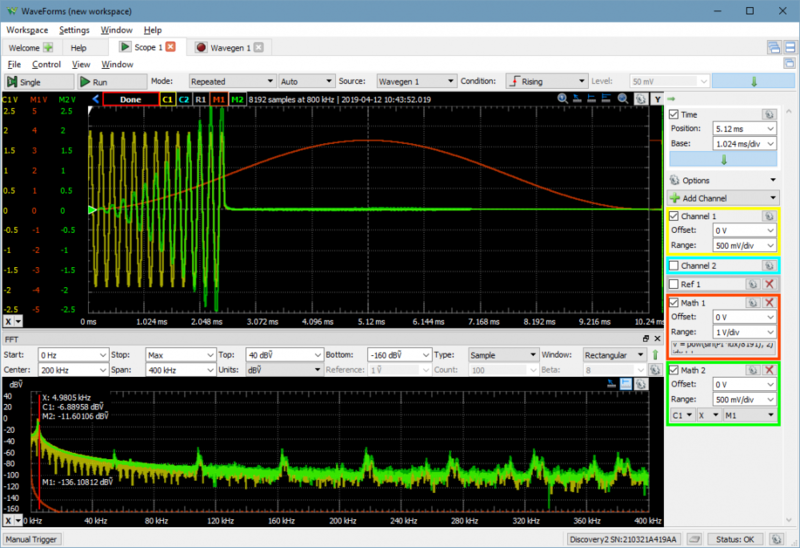 This graph below is comparing Waveforms and Sigview, both Hann windows, both using no padding. They are basically identical, except for a 3dB offset. 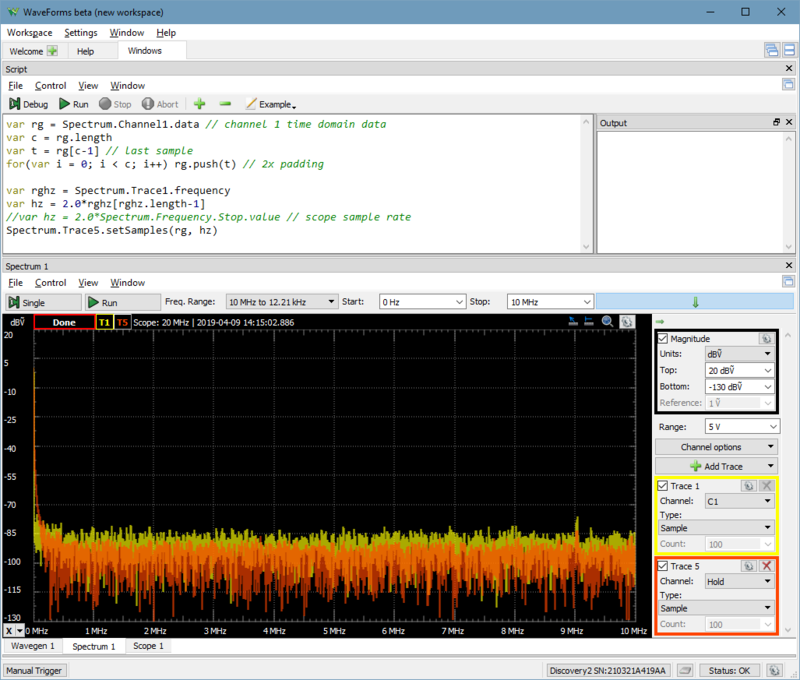 I used magnitude in Sigview and RMS (dB) in Waveforms, which I think accounts for that 3dB. But the important thing is that the shape of the FFTs is identical. Same data in both cases, same window (Hann), both programs produce the same FFT. Now, I add padding in Sigview. Blue is 2x padding, magenta is no padding. The traces are nearly identical, except the padding in the blue trace helps smooth out the peaks. I think this is how the padding should work. It looks like you added the padding, then did the window, then did the FFT. As you mentioned, applying the window after the padding really attenuates the actual data and adds more emphasis to the 0's. I would like to add the padding in Waveforms so we can take advantage of the averaging. With Sigview, I'd have to import many static datasets, process each one separately, and then average in C++, which would be much more laborious and time consuming. Sure, it makes more sense to apply the window only on the real data section. The noise floor difference is due to different captures. Thank you @attila! The windowing before the padding seems to have worked. We'll have to experiment with the CZT to see if it will meet our needs and perhaps be easier than an FFT with the padding script. I would like to export the data after all of the windowing/padding/averaging is complete. ...but this gives me the results for Trace1, Trace5, and Trace 6. 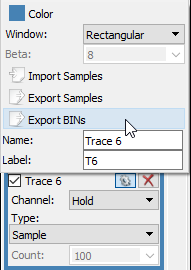 Is there a way to export only Trace 6? but that gave me an error.